The Glee Club exists, as a part of the narrative, to bring characters acceptance and joy. Glee is there for Finn, and for Puck, and for Quinn, and for Tina and Kurt and Santana and Brittany and all of them - as a place where they can be themselves and be happy because of it. Incorporating the popular kids into the Glee Club is one of the show’s driving arcs, along with allowing the loser kids to be accepted for who they are - and both of these ideas are fostered by the existence of the club. 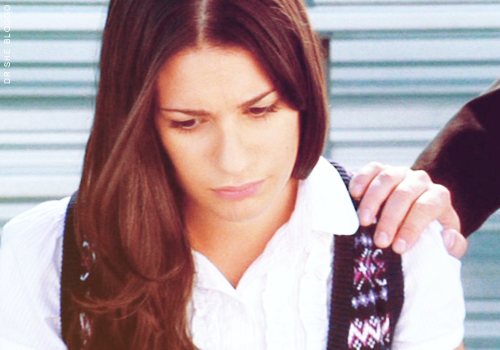 For many of the other characters, Rachel Berry often represents Glee, and therefore allows their development to interact with the notion of acceptance for the purpose of their arc - evidentially this has been the case for Finn, Quinn, and Puck as they work towards embracing their inner loser. Rachel therefore is a fixture for these characters. This begs the question: how does this general idea manifest itself in Rachel’s character arc? What is fascinating about Rachel’s place in the show is that she is a fixture. She is the Glee club, but functionally speaking she is not a part of it. She is hovering somewhere above it, acting as a leader and a soloist, but is never really “one of the gang.” So the idea for Rachel is not necessarily to have her accept her inner loser with pride, but rather to ground her amongst the other characters as a functional member of the Glee group. This is outlined in the very first episode. Rachel was almost immediately constructed as an isolated character. Consider her original solo: “On My Own.” In one way, the song speaks to Rachel’s lovesick nature, yes; but on the whole it’s a testament to the idea that Rachel is isolated within the narrative, in almost every way. And not only that, but Rachel’s conversation with Will in the bleachers establishes that she doesn’t want to be isolated. It’s this scene that identifies where Rachel Berry’s character arc needs to go. “Being a part of something special makes you special,” she tells Will, and whether or not that’s true, it’s clear that Rachel Berry wholly believes that. And even though she’s been in Glee Club since Day One, Rachel Berry is not truly a part of Glee. The show has mostly made good on the promise that Rachel Berry will be accepted by her peers - but it’s been a bumpy, prolonged, and inconsistent road. “The Rhodes Not Taken” - the fifth episode - presents us with the idea that Rachel values being friends with her fellow Glee clubbers more than she cares about having a solo, and yet the writers have circled back on that idea and left it unfulfilled on more than one occasion. In the F13, Rachel didn’t have a real friend in the club, and yet she was still developed as a sympathetic and compassionate person - she reached out to Quinn in “Throwdown,” helped Finn in “Ballad,” and conceded a solo to Mercedes in “Sectionals.” At the end of “Sectionals,” Rachel could perhaps be considered at the end of her arc - all signs seemed to point to the fact that since she saved the day, had a moment with Quinn, hugged Mercedes, and believed Santana, that she had been incorporated into the club as a friend. But in the Back 9, the writers rewound the tape and returned Rachel to her position of misfit both in McKinley as well as in the glee club. The first minute of “Hell-O” showed her having a conversation with Kurt and Mercedes, and we all rejoiced, thinking that perhaps they were actually friends now! But then, we got slapped in the face with a cold slushie of truth, and the illusion was shattered. After that, we realized that not much had changed at all. Finn rejected Rachel in favor of the popular girls, all of whom continued to verbally abuse Rachel as a punchline to one of Glee’s favorite jokes. Then, before anything else could happen, the show immediately maneuvered Rachel out of her arc, and chose instead to develop her in conjunction with a love interest from a different school, and the reveal of her mother’s identity. The Back 9 did little to nothing for incorporating Rachel into the Glee club because the writers didn’t have to - they chose not to. They isolated her again, removing her from Glee interactions on account of her new boyfriend. The only moment where Rachel Berry was supported by her peers was after the egging incident in “Funk,” and that was lovely to see. But other than that? Not much. “Journey” fulfilled only the story arcs with Finn, Jesse, and Shelby. She didn’t even go with the whole club to the hospital for Quinn’s baby - she stayed and watched Vocal Adrenaline, and had a talk with Shelby, because it was what her storyline was about. Season 2 further moved Rachel away from incorporating her into the Glee club - at least initially. “Audition” found her threatened by the existence of a new student capable of upsetting the distribution of leads away from Rachel, and Rachel’s outlandish reaction to that. You’ll allow me a brief moment of rant, please, when I talk about her actions in “Audition” - because first episodes after hiatus are not always kind to Rachel Berry. Now, the inherent issue in Rachel’s arc is that she sometimes stands in her own way while trying to be accepted. The other characters can’t understand her bossiness or ambition, and so they write her off as an irritation. This isn’t always an issue in the short-term, as long as we, as an audience, understand why Rachel is the way she is. The writers were fairly reliable in their insistence on letting us in Rachel’s head. But “Audition” was the first big misstep. Rachel’s actions in that episode were to send Sunshine to a crackhouse, and we never really understood why. We knew she was threatened, but we thought it was funny, and annoying. Sing-off in the bathroom! Hilarious! This is Rachel the Glee Clown being used for a joke, right? Well, no. Not when the result is Rachel putting another character’s life in danger. That’s a huge action, and we weren’t given a huge (and therefore empathetic) reason to support it. We didn’t see Rachel’s moment of choice in that episode - we just got info from Mike and Tina and everybody got all mad at Rachel, and she lied about her motives for doing it. Really, writers? The amount of unwarranted hyperbole in Rachel’s actions during “Audition” was really not okay. It was the first time they took Caricature Rachel Berry and used her for plot device instead of comedy, and that’s a terrible idea. To boot, the machinations unfortunately moved her a half-dozen steps back in her character arc as a result. The last moments of “Audition” show Rachel singing “What I Did For Love,” in complete isolation again. She literally stands outside the Glee Club classroom, looking in at everyone having fun without her. “Audition” presented us with the notion that Rachel Berry will choose herself and her solos over friendship and compassion, which is in direct conflict with previous development the writers gave to her. It essentially undoes Rachel’s characterization a bit to be able to build it back up to a goal, because the writers aren’t sure how to maneuver a character towards the fulfillment of his or her arc. In the Finn epic, I spoke about Finn’s repeated choice of football vs. Glee, and how his development is stuck on a carousel. This is Rachel Berry’s carousel - she is brought up to a point where she may play a healthy and functional part to her environment, only to have potential friendships and acceptance yanked away again by a not-entirely-in-character action. This carousel is a bit more heartbreaking in Rachel’s case, because it denies her the opportunity to be a part of Glee club, and at the expense of positive characterization. She’s perhaps the only character in the club that gets emotionally excluded from that part of the show’s theme - which is tragically ironic considering she often represents Glee within the narrative. After “Audition,” Season 2 did bring the possibility of human connection back to Rachel, although I hate to say that it wasn’t really through her relationship with Finn. Unfortunately, most of their romance manifested itself in drama, arguments, and insecurity, and there were precious few moments when the couple was allowed to be happy - but more on Finn and Rachel later. The good news in all of this is that Rachel’s kinship with Kurt was kept up, and together with Mercedes, the three of them formed their own little Diva Trifecta Friendship. That has been one of the true successes of Season 2, although the development of the relationship could frankly have been stronger. Even so, the result is more than worth it, and the few opportunities where the writers could have created lasting conflict between the three (“Comeback,” and “Blame It On The Alcohol” in particular) were avoided, thankfully. Furthermore, you can see the development towards acceptance in the variety of leads that Rachel has had in Season 2. She has not been exclusively a soloist, or a lead in a group number. She’s had duets with Kurt, Holly, Mercedes, Puck, and Blaine, as well as with Finn. This has been an important step in Rachel’s arc, and helped to move her through to the second mid-season finale. Everything in Rachel’s development has led directly to her moments in “Original Song,” and the creation of “Get It Right.” The bullying, the isolation, the good intentions gone awry by poor decision - everything culminated in “Get It Right,” as her peers finally understood what it’s like to be Rachel Berry. "Get It Right" is not about Finn. "Get It Right" is Rachel Berry, boiled down into her very essence and put to music. The idea that that song, Rachel's Song, helped them win the competition bolsters her purpose within the narrative, and allows her to move forward in her arc towards true friendship with her peers. The curtain call of that notion is in Rachel’s acceptance speech of Glee Club MVP: she doesn’t care about the gold star trophy she won. She cares about feeling special. Finally, after 38 episodes, Rachel Berry is a part of something special. Group hug! Now, let’s hope that this will stick when we come back from hiatus, and we won't have to take another spin on the Glee Character Carousel: Rachel Berry Edition. Again, I highly agree with the majority of what you had to say. Ryan, Brad and Ian take it in turns writing eps, so the fact that Brad went from s2ep1 Rachel to s2ep4 Rachel, where she reaches out to Kurt in the loveliest way, even though he is still trying to reject her (I really hated Kurt until recently, I couldn't stand they way he and Mercedes treated Rachel) is utterly ridiculous. If you put the two episodes together it's laughable, but that's how Glee rolls and you have to just accept it. Glee also does a funny thing in how it labels and categorizes the kids. If you really look at it, Quinn, Finn, Santana, Mike, Matt, Sam are the sporty kids, all the popular ones, Puck is that bad-boy, popular, Tina and Artie would get a serious rep upgrade due to their other halves, Mercedes is by no means a loser, there's no way she doesn't have other outside friends, Lauren has plenty of self-confidence and seems to have wrestle friends, so that just leaves Kurt and Rachel. Rachel is really the only one of the group who is an actual loser. Kurt has some issue with this, but not really, he befriends Mercedes very quickly and the first time we really meet Brittany is when she and Tina are helping Kurt dance, and she's quick to defend him and lie to Burt for him. Basically, everyone else has a clique they fit into. Kurt's is difficult because he's gay in a small town, but he manages. Rachel literally has nothing. She doesn't have a single friend. Finn is the closest she gets and that's possibly even sadder than having no friends at all. I think all the other kids kind of play at and explore the idea of being an outcast, a loser, a reject in Glee, but Rachel is really the only one who knows what it's actually like and that's the separation. They have other identities to resume when Glee is over but Rachel really doesn't. This is what you were going for right? I can't believe there are five more days of this Rachel love, it's uber thrilling! And now I need to go re-watch the "I know you're lonely..." speech. Oh, and I wanted to add how I much I did. Not. Like. How Rachel was written in "Audition". "...I spoke about Finn’s repeated choice of football vs. Glee, and how his development is stuck on a carousel. This is Rachel Berry’s carousel - she is brought up to a point where she may play a healthy and functional part to her environment, only to have potential friendships and acceptance yanked away again by a not-entirely-in-character action." 1) Undoing character growth only to repeat it very similarly, e.g., Finn with his popularity, as you mentioned, and Rachel having to choose between the lead and friends, though she seems to think the former will get her the latter. Which brings me to how it just seems against everything in her to do what she did to Sunshine. For all her lack of confidence in certain areas, her appearance, her likability, the one thing Rachel Berry has always been annoyingly though adorably sure of is her voice. And as much as she's pinned all her hopes on New Directions, both to fulfill her dreams of stardom and to gain her acceptance and let her belong, how would Sunshine be anything but another extremely effective weapon in ND's, and thus, her arsenal? But fine, let's say she is threatened by Sunshine. Rachel Berry has never been cruel. 2) The inconsistency with which characters are treated. You and your commenters have already both talked about how when Sue throws people down the stairs or into lockers or Puck and his pals put kids in the dumpster, it's funny (or "funny"), but Karofsky's the one who crosses the line. At first it seems as if "Rachel sent her to a crack-house" is just some throwaway joke but suddenly it has consequences? Really? And everything said to Rachel, even well into the second season, that's nothing? Mhmm. Heh, sorry about going on and on. I...have strong feelings about this, apparently. Ooh, and one last thing! I do love the Diva friendship and only wish it had started earlier and that we see more of it. Booasaur - I'm with you on "Audition," man. I refuse to believe that Rachel sent Sunshine to a crackhouse. Did that happen? Nope! I'm blissfully in denial about that, because it just makes me angry. And yeah, the writers have a hard time balancing tone and hyperbole and when it comes to the comedic portions of the show. Part of the issue with "Rachel/friends" is that, while fans tend to fixate on it, the writers of the show tend not to place much emphasis on friendship in general. In a crunch, the characters never rely on friends (except when "friends" means the Glee Club as a whole singing a song together); they're either alone, or with significant others. The only really lasting friendships on the show, historically, were Brit/Santana and Kurt/Mercedes. The former doesn't count anymore because it's officially a romantic pairing (and was chock-a-block with homoeroticism even when it wasn't); the latter has really never amounted to anything in a clinch. Mercedes has had no real role in any of Kurt's various personal traumas (except in "Grilled Cheesus", and even there the emphasis was on her failing to connect for the most part), and in Mercedes' rare moments in the spotlight ("Home", "The Substitute"), Kurt's not much assistance. You can even note how precipitously Finn/Kurt interaction drops off once Kurt's one-sided romantic interest is laid to rest. scurley - Yeah, the show's persistent ignorance towards friendships is really, really frustrating, and the examples you listed are totally evidence of that. Why don't the writers seem to understand that we love it when these kids are friends with one another? Sigh.